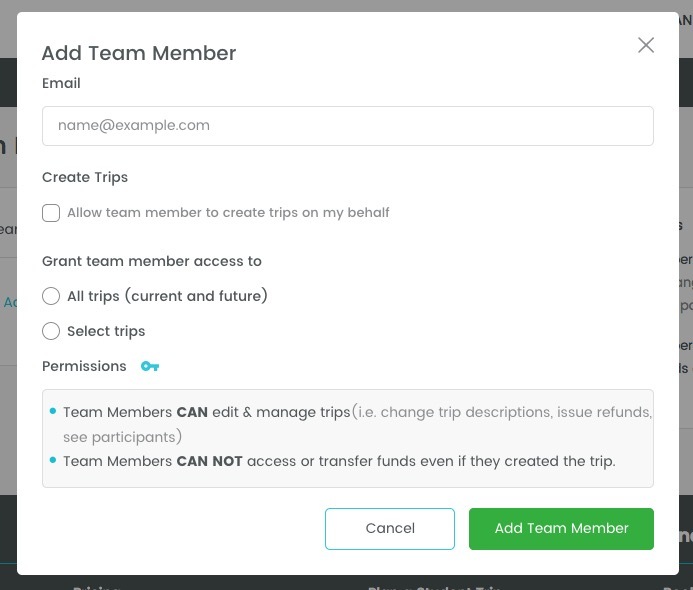 Create Trips: Decide if you want to let the team member create trips in your name and on your behalf. Even if they create trips in your name, they will still not be able to control funds. Only you as the main account holder will have access to initiate the payout of funds. P.S. If a team member copies a trip then the original organizer will be locked in. Access to trips: Decide which trips you want the team member to be able to access. You can select all trips, only selected trips (via a tick-box feature), or just give the team member access to trips they've created themselves. The team member will see all trips that you have given them access to in their "My Trips" list. If they are co-organizing a trip of yours, they will see "Created by" next to the trip. In the example below, "Bethanie Thompson" is the main account holder who has added "Lowell Smith" as a team member and given him access to her trip. Anyone that you add as a team member can edit and manage the trips you give them access to. They can, for example, change the trip description, deactivate the trip, issue refunds, set custom prices, cancel bookings and download payment histories and participant information via Excel. Team members can NOT access or transfer the collected funds, even if they created the trip. They also can't see the amount of funds the main account holder currently has available in her/his WeTravel account. Only the main account holder can initiate the transfer of funds from her/his WeTravel account. How to organize a trip on behalf of someone? Creating a trip on behalf of someone is easy. Just make sure to select the person/company that you're working for when checking the selection "Organize trip as" in the the Trip Basics section. The organizer will be locked in after the trip has received its first booking. By doing this you can make sure that all of the funds collected are stored in one place - the main account. All itineraries created by team members will still show parent person/company logo and information. I'm co-organizing a trip, how can I add the co-organizer to the trip page? Giving a team member access to your trip does not change the way the trip is displayed to participants. Other team members will be able to manage your trip, but your participants won't know that. You as the main account holder will still show up as the only organizer. Change your existing profile (or create a new user) with the profile name being a combination of your names (e.g. "Bethanie & Lowell" instead of "Bethanie Thompson"). Add a custom paragraph "Organizers" in the "Trip Description" when you create your trip. In this paragraph, you can give more information about the various organizers. How can I give access to a team member to a few selected trips AND also all the trips that she/he created? 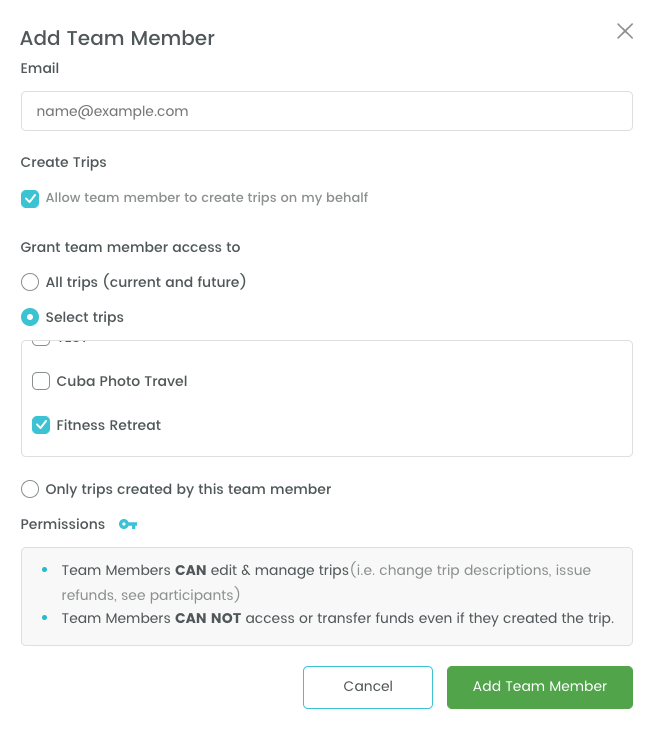 If you tick the box "Allow team member to create trips on my behalf", team members will automatically have access to the trips they created (until you delete them). So, if you want to give them access to a few selected trips in addition to the trips they've created, simply tick the box "Allow team members to create trips on my behalf" AND click "Select Trips" for the trips you've previously created and want to also provide them access to. What emails/notifications will I receive? What emails does a team member receive? If a trip is created by you and you give access to a team member, you will receive all the notifications related to that trip (your team member will not receive notifications). If a trip is created by your team member on your behalf, then you will BOTH receive all notification emails related to that trip (new bookings, inquiries from participants, etc. ).